On An Overgrown Path: Do you know any really normal people? 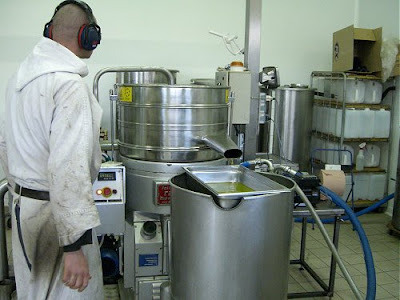 Do you know any really normal people? But the idea of a normal person is a fantasy of the mind. Do you know any really normal people? I don’t. That quote from Buddhist monk and teacher Ajahn Sumedho is a useful reminder of the dangers of dualist judgements between normal and deviant. In the past I have been critical of the political deviance of the Benedictine community at L’Abbaye Sainte-Madeleine in Le Barroux, France, and the arrival of the new CD seen above gives me a chance to redress the balance a little. Le Barroux is far more than a monastery; it is an eclectic experiment that uses live audio streams and mobile apps to reach a global congregation, while at the same time revitalising the local area with a state-of-the-art olive mill - see my photo above - that services local smallholders, and a bakery that attracts customers from miles around. 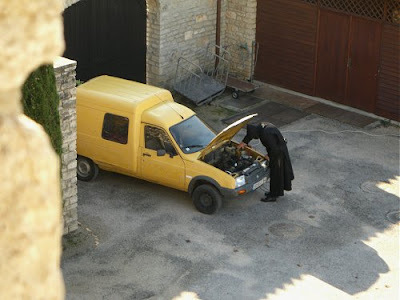 These monks certainly have the technology habit, and the candid shot below of one of their number administering last rites of the mechanical kind was taken from my bedroom window during one of my visits to Le Barroux. 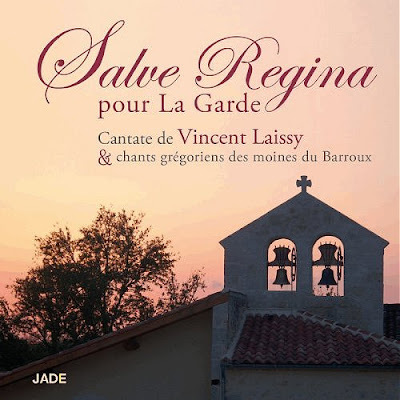 But the finest product of the monks at Le Barroux - other than Divine Grace - is Gregorian chant, and their latest CD for the Jade label is a celebration of the Salve Regina, that most sublime of the Marian antiphons. On Salve Regina pour La Garde Gregorian chant from the monks is juxtaposed with organ works played by the young French composer and organist Vincent Laissy, all captured in superb sound in the resonant acoustic of the Abbey church by Igor Kirkwood. The programme ends with Vincent Laissy’s own refreshingly adventurous twenty-five minute cantata Salve Regine pour La Garde for voices, string quartet and organ, recorded with professional forces in Paris. The La Garde of the title is a reference to the new monastery in south-west France being built by the monks from Le Barroux - see the photo below - and the CD will help raise funds for the project. More details of Sainte-Marie de la Garde – ‘a monastery for the 21st century’ - can be found at the website www.jeconstruisunmonastere.com, which translates as ‘I am building a monastery.com. 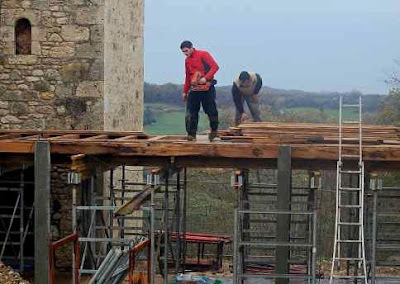 Traditionalist Catholics they may be, but the monks of Le Barroux do not miss a trick, and they even have an unlikely link with Lady Gaga. Who needs really normal people?